Through the flap of her tent, she looked up at the stars lighting the brilliant desert sky, and she began to count. It was a new day, a season of unspeakable joy. While they were living in the land of the Philistines, Isaac grew healthy and strong. (Gen 21:34) Though he was still a little boy, Abraham and Sarah could see the face of a man beneath the surface of his smooth, olive skin. They loved Isaac and clung to him like a promise from God. So on the day Abraham came to tell Sarah about his most recent visit from the Lord, the look of vacant grief in his eyes told her that whatever they had discussed, it involved her beloved Laughter, and it was not happy news. God wanted Abraham to do what? Early the next morning, Abraham got up. It had been the most restless night of his life. The burden of God’s confounding command consumed his thoughts. Who could sleep knowing what he knew? 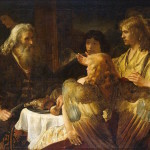 Abraham had become a wealthy nomad. He had servants to tend his livery, so he almost never tacked his own mount. But on this morning Abraham saddled his donkey in solitude. This mission was particularly his own. Though two servants would accompany him and Isaac, no one could share the lonely, sacred mission burdening this old father’s heart. He gathered some clothes and some food and water. He cut and bundled wood for the sacrifice. And then he went to where he kept his knives. He studied them—their length, the truth of their edge. He chose one. It was heavier than he remembered. How could he make sense of any of this? This son was the promise, born of supernatural, divine intervention. Wasn’t this the boy through whom all the nations of the earth would be blessed? The one who would fulfill the covenant God had cut with Abraham? Had God really sent this child into the world to die as a sacrifice on a hill in the middle of the Promised Land, in effect killing the promise itself? No, there had to be another way. Perhaps, as absurd as it sounded, God would raise him from the dead. 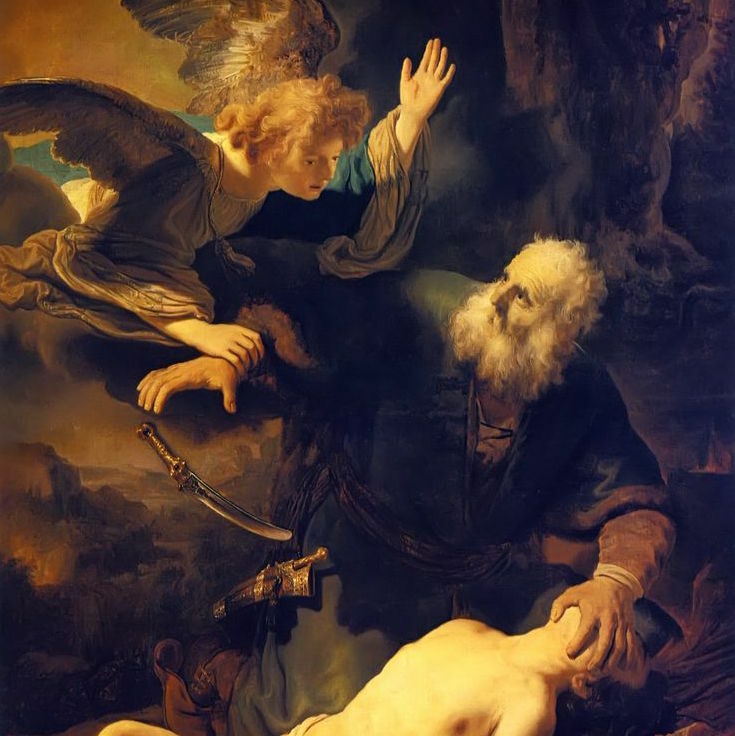 (Heb 11:17–19) Abraham held to that hope, and for three days, with the hill in the distance drawing ever closer, Abraham believed he would have to experience the sensation of plunging a knife he chose into the heart of his own son. No amount of belief in the resurrection could chase the terror of this away. Leaving the servants to tend the beasts, the father and his only son ascended the mountain alone. On the summit, Abraham built an altar, arranging the wood upon it as Isaac watched. When the altar was complete, Abraham turned to the boy to explain what needed to happen next. With his son’s compliance, Abraham bound Laughter and through tears laid him upon the altar. And then he raised his knife. He looked to heaven, then at his confused and fearful son. His muscles went tight as he realized that he was actually about to do the unthinkable. He had it in him. He would go through with this. He would. Abraham looked up and couldn’t believe what he saw. How had he not noticed it before? Incarnate before him, caught by its horns in a nearby thicket, stood a ram, as if it were sent to ascend this hill from the other side for the purpose of dying in order that Laughter might live. This message wasn’t new, and that as much as anything made it ring like a sweet song in Abraham’s ears. It was the same covenant oath the Lord had sworn since the very beginning, and God had shown himself faithful. 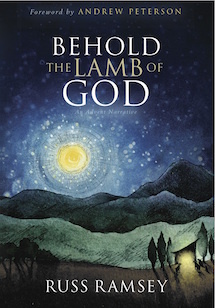 About the Post: This post is an excerpt of chapter 5 of my 2015 release Behold the Lamb of God: An Advent Narrative, Rabbit Room Press, 2011. About the Art: Rembrandt Harmenszoon van Rijn (1606-1669), The Angel Prevents the Sacrifice of Isaac, oil on canvas, 193cm x 133cm, Hermitage, St. Petersburg, 1635.